When Joan Miró wrote that “the march of the world is leading towards collectivity” he likely drew from his experiences with printmaking. The comradery and shared activities of printing processes enlivened the Catalan master. Friendship prompted his first foray into printing; conversations and admirations among Miró and surrealist poets during the early 1930s resulted in printed illustrations that were among his earliest graphics. Print shops provided Miró with welcome breaks from the solitude of a painting studio as well as dialogue with the outside world. Miró’s lithographs and etchings resulted from happenstance occurrences and personal interactions unlike his paintings that were preceded by investigations in isolation. Master printers became Miró’s friends and provided great inspiration and comfort. He mentioned, “I work at my engraving in a team. . . They give me ideas and I take them fully into my confidence. But if you want to remain a star, it’s impossible.” Intaglio printmaking prohibited isolation; Miró’s etchings were a chorus of plate marks and personalities. Lots 1-5 are masterworks in the medium that date from Miró’s most advanced period. Depicting characters encountered throughout a life spent traversing France and Spain, his prints burst with the vigor of friendships, imagination and memories. Le Permissionnaire (Soldier on Leave), lot 1, was an off-duty and elated young soldier like one that Miró would have encountered throughout his travels during the great wars. Areas of vivid color and even a handprint ensconced a black figure sprouting string-like appendages. Late-career etchings continued Miró’s legacy of depicting wide-ranging personalities with dimensionality though his unique eye of interpretation. The imperfection of humanity continually motivated Miró’s intaglios; Le Maréchal des logis (The Sergeant), lot 4, presented a dominant figure commanding authority, yet looking like a whimsical bird. While he depicted L’Oustachi (The Ustachi), lot 5, as a fearful follower in vibrant colors, the very next print he created, Le Brahmane (The Brahman) referenced the Hindu idea of supreme cosmic power! Miró’s cast of characters were diverse and filled with life. The large format and visual diversity of Le Sarrasin à l'étoile bleue (Saracen with Blue Star), lot 2, Le Permissionnaire and L’Oustachi were examples from a confident master at liberty to improvise, work ambitiously and trust in his collaborators. 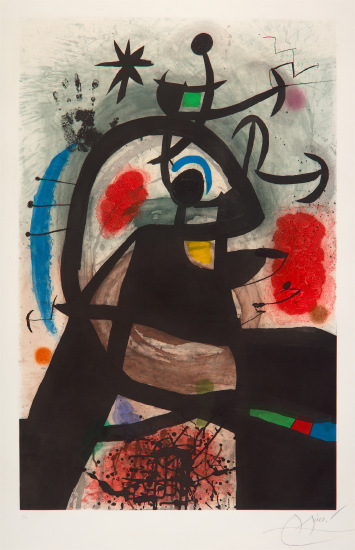 Amongst all of these people, animals and surreal ideas, Miró asserted his unique form of whimsy as enjoyed in Souris rouge à la mantille (Red Mouse in the Mantilla), lot 3, and created two color versions using different plates and colors as well as a Pollock-style dripping of aquatint. Even during prolific periods of his painting practice, Miró found motivation in waking up early to work at engraving. By the mid-1970s his output approached a ferocity that belied his advanced years. More than 60 intaglio prints were made between 1974 and 1975 alone, a testament to the vitality that Miró took from his work in the medium. Miró continued to engrave enthusiastically until his death in 1983 with a number of projects printed but not yet signed. His very last completed works from 1981, lots 137 and 138, Lapidari “Llibre de les propietats de les pedres” (Lapidary “Book of the Property of Stones”), lot 137, and one example from Llibre dels sis Sentits (Book of the Six Senses), lot 138, ended his illustrious career with a reflection on the natural world. Etching and aquatint in colors, on Arches paper, with full margins. Signed and numbered 6/50 in pencil (there were also some artist's proofs), published by Maeght, Paris, framed.